1. Place all of the dry spice ingredients in a bowl together and mix well. Place the pork shoulder in a bowl and sprinkle the spice rub on the surface of the meat, cover and allow to rest in the fridge overnight. 2. To barbecue, prepare an indirect heat barbecue by stacking the coals to one side of the pit and placing a heatproof tray filled with water on the other side – this creates an area which will gently cook and smoke the meat. Light the coals, place the grill over the barbecue and preheat for 30 minutes. 3. Oil the grill and place the pork shoulder on the cooler side of the grill (over the water tray) skin side up. Cook for 4 hours, adding more coals if necessary. The water tray should be constantly simmering – add more water if required. 4. Double wrap the joint with aluminium foil and place back onto the barbecue for a further 4-6 hours until the meat is falling apart. 5. Alternatively, to cook conventionally, preheat the oven to 200ºC, gas mark 6. Place the pork on a rack over a large roasting tin half filled with hot water. Roast for 30 minutes. Reduce the temperature to 100ºC, gas mark ½ and cook for a further 3½ hours. Double wrap the joint with foil and place back on the rack in the oven to roast for a further 4 hours until the meat is falling apart. 6. 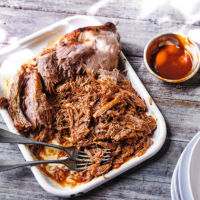 To finish, pull the meat apart by shredding with 2 forks and serve with the barbecue sauce.